I haven’t felt much like shooting this summer, and I think I just figured out why: I still haven’t finished sorting through the 6,000-plus images I took while traveling with Esteban last December! Well, let’s see what we can do about that backlog, shall we? But try as I might, I couldn’t figure out how to actually get there (at least not without a car). A train used to connect Freiburg and Colmar — which are only 45 miles apart — until the bridge over the Rhine was blown to smithereens in 1945. Since then, the tracks have ended abruptly at the German border in Breisach. “Wie kann man nach Colmar fahren?” I asked the teller at the Banhof in Freiburg. 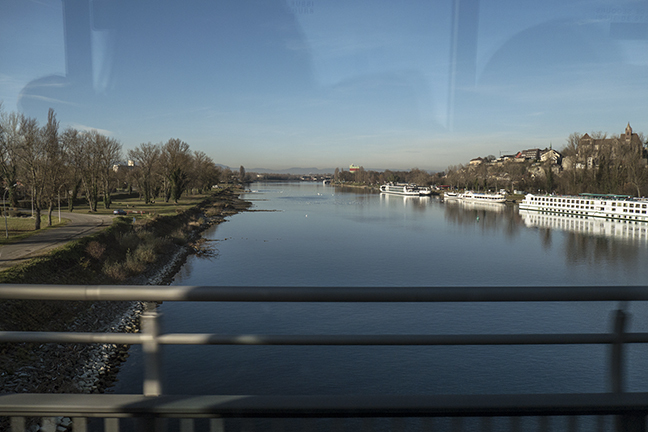 Stifling a laugh at my horrible Akzent, she told me to take the train to Breisach, and then the bus. Esteban and I have an unhappy history with buses — we once got stranded in rural Tuscany — but getting to Colmar could not have been easier. Here’s a synopsis, as a service to future travelers. Take the ICE train from Freiburg Hbf to Breisach. 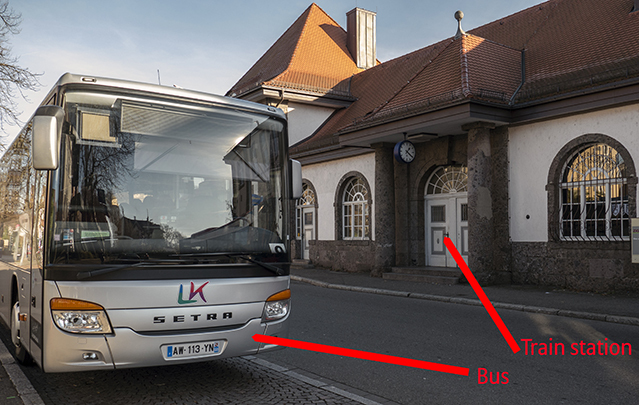 Get off the train in Breisach (there’s only one stop) and walk across the street to the bus stop. Look for route number “1076” on the sign. 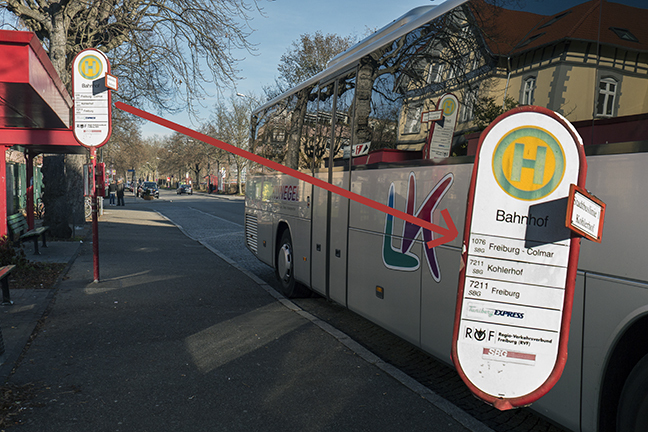 When the bus arrives, pay the driver (about €9, if memory serves) and you’re on your way. If you are at all a history buff, the sights from the bus alone will be worth the price of admission. 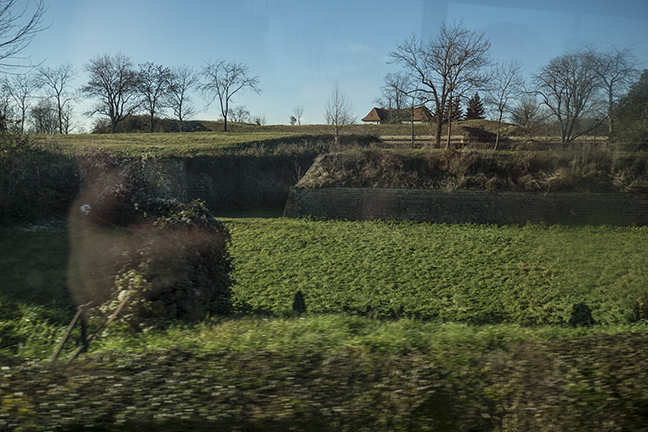 Our bus driver wasn’t especially talkative, so I’m not sure whether these trenches were Napoleonic or a leftover from World War II. But I’m pretty sure they’re historic. 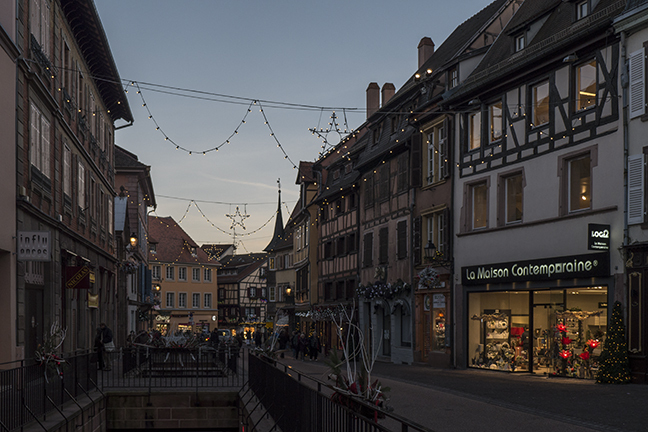 Once you get to Colmar — about a 45-minute ride — you can get off at either the Theater stop (closer to the old town) or at the train station. 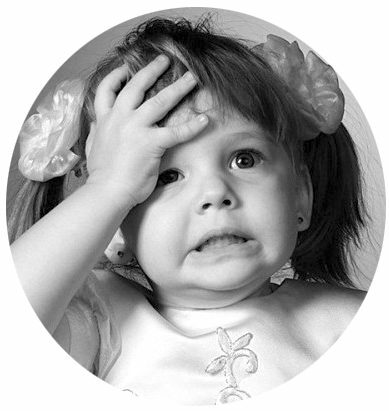 Please note that there is no luggage storage in the train station, so plan accordingly. … and these Victorian-era boot-scrapers. 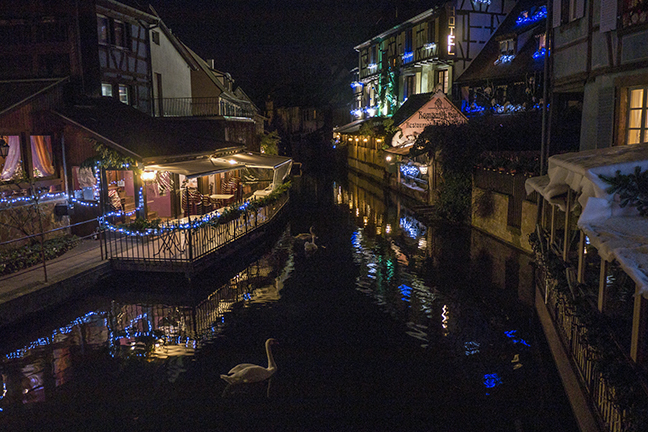 If you’re curious about the rest Esteban’s and my adventures in Colmar (including the day we almost caused a fire), you can catch up here. … but instead, a thick fog soon enveloped the entire city. 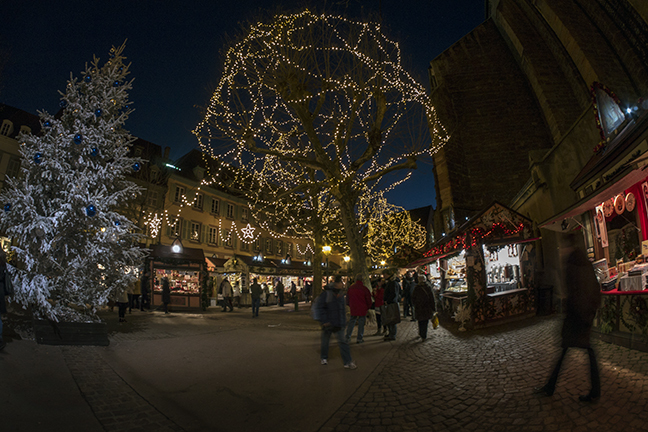 It felt so different in the subdued light that I risked missing the train to Strasbourg to squeeze in one last stroll. 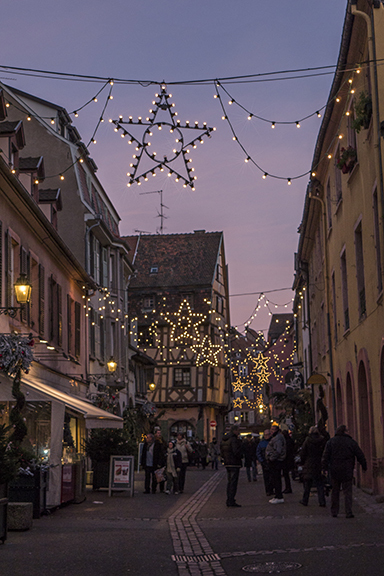 There is much more to say about Colmar, but Strasbourg and Paris and New York and Chautauqua await. So, for now, I’ll leave you with one last look at this beautiful medieval town. Back with more travel adventures soon! Wow, it’s especially lovely in the fog! These little German towns always look like miniature villages to me. The way they look so neat and clean makes me think they aren’t real; which they probably aren’t, since the Allies bombed the bejesus out of them during the second World War and they’ve had to be rebuilt. But I really love the last picture in your series. Seeing it makes me feel one step closer to understanding Cubism. “Seeing it makes me feel one step closer to understanding Cubism.” You are so witty, Xpat — and when you *do* finally understand Cubism will you explain it to me, please? Grin. I also loved your observation about how quaint and almost manufactured these little German (or now-French) towns look. 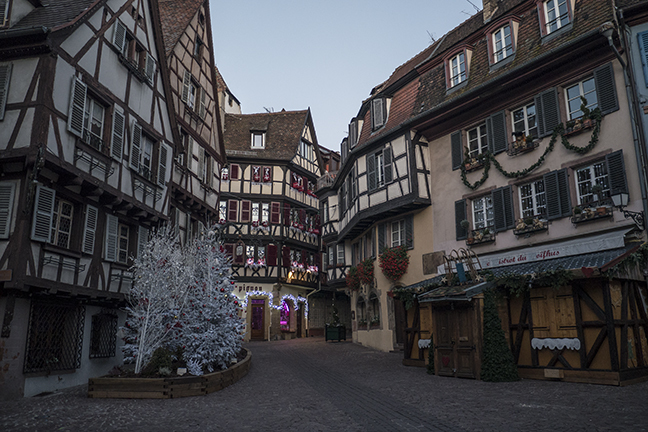 One thing I should have mentioned in my post is that Colmar is unique in that it was never bombed. The city was besieged for a while and there was a lot of fighting in the surrounding woods, but what you see is pretty much intact as it was built. Astounding, isn’t it? I really was charmed by the place; it was like walking around in a fairy tale. Again, these misty shots, amazing…. What time in the morning do you get up to shoot them? 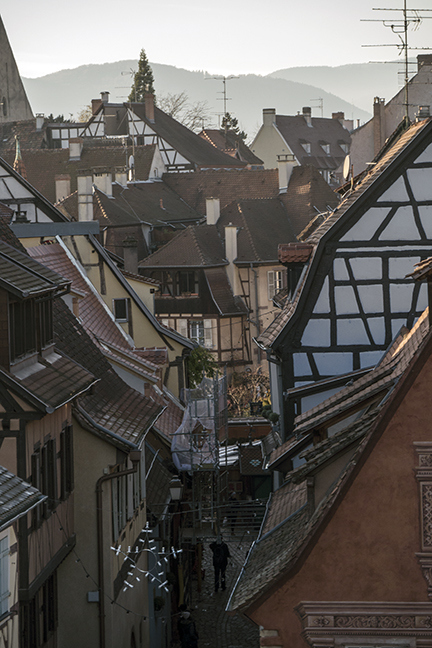 Thanks for sharing how to get to Colmar from Freiburg. It was very helpful. We’re on our way to do this tomorrow and I was getting a little confused by some of the other things I was reading. Great pics too! Thanks! I’m so glad my post helped! And i’m also a wee bit envious — you’re in for a treat. Have a wonderful time, and if you think of it please drop me a line if you decide to do your own post about it. Thanks for stopping by!